‘Defining the garden’ is at the heart of Grange Fencing’s philosophy. We believe that the best way to achieve a beautifully designed landscape is to break the available garden space up into a series of outdoor ‘rooms’ and ‘zones’ for different uses, whether that be relaxation, entertainment or even storage. In doing so, the garden can be thought of as an extension of your home and enables you to maximise its space and usage. This concept of ‘zoning’ can be achieved through the use of garden features such as Screens, Arches and Arbours. Our comprehensive choice of collections includes uniquely designed architectural structures to suit all styles of outdoor space, from city balconies to large country gardens. For the more minimalist gardener, our Urban range is a progressive collection boasting clean lines and modern aesthetics. With the inclusion of the Urban Screen Planter, there is something to suit even the smallest outdoor space. Making for an eye-catching stand-alone feature, the Urban Planter can also be used alongside the matching Urban Garden Screen, Urban Garden Arch and Urban Garden Pergola for a coordinated look. These larger garden structures offer a simple alternative to more imposing designs, providing the ideal solution to creating stylish zones within small to medium sized gardens. For larger gardens, the Contemporary is a premium range offering a versatile choice of elegant pieces including an impressive Contemporary Arbour and Contemporary Garden Arch. Featuring rounded and chamfered edges, both provide substantial, sophisticated additions to the garden. 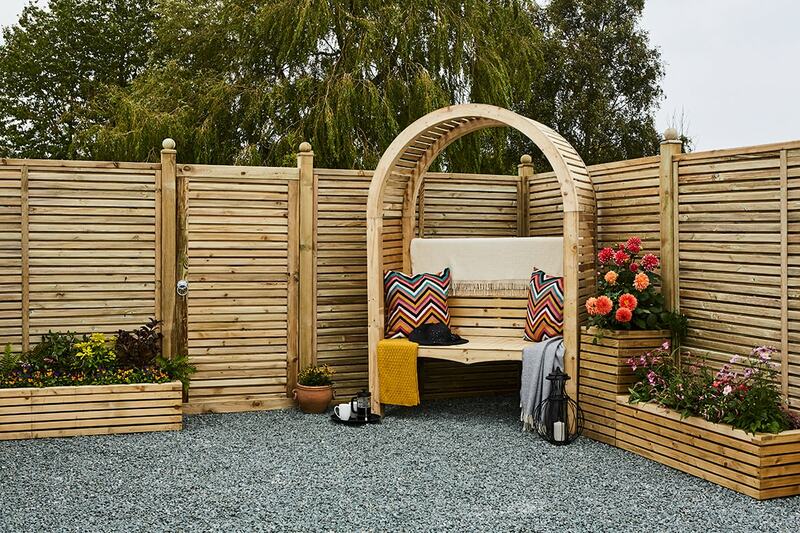 The domed Contemporary Garden Arch is ideal for emphasising a well-loved view or breaking up an expansive outdoor area whilst the Arbour offers the perfect retreat for relaxing with a favourite book. Alongside these on-trend collections, our Valencia range offers a timeless style that will compliment more traditional gardens. Featuring an Alderley Lattice design, the range includes a Valencia Arbour, Trellis, Valencia Arch and a particularly striking Valencia Corner Arbour – perfect for entertaining! As with all Grange products, the items within the collections feature timber that is pressure treated to prevent against wood rot and decay. There is also the opportunity to purchase many of the items in a choice of pre-painted natural tones. To find out more about our Collections and other Grange products, visit our products page to browse our full range.